Already listed with our Phuket mini golf directory? Your putter swing in a good posture on the mini golf course. Exciting Phuket mini golf courses are providing elegant designs and shapes uniquely. 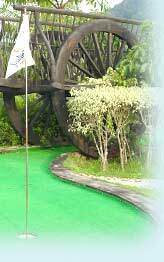 A wide selection of mini golf in Phuket is put in the listing to make you the better decision. Visit Patong Park and enjoy Bungy Jump, Mini-golf, Bowling, Snooker, and Thai Boxing, for school and corporate events. Phuket Adventure Mini Golf is a challenging 18 holes miniature classic championship golf course surrounded by palm trees, stones, water, bamboo, sand and bushes.